Hello, spring!!!! It’s nice that you plan to show up early!! It’s going to be warmer next week, so time to run….gotta start training for that 8K in September…and get back into my beach body by July…but I got to get through this month first! There’s sooooo much chocolate and goodies to eat, and did I just read today about eating chocolate every day has health benefits?? How cool is that! 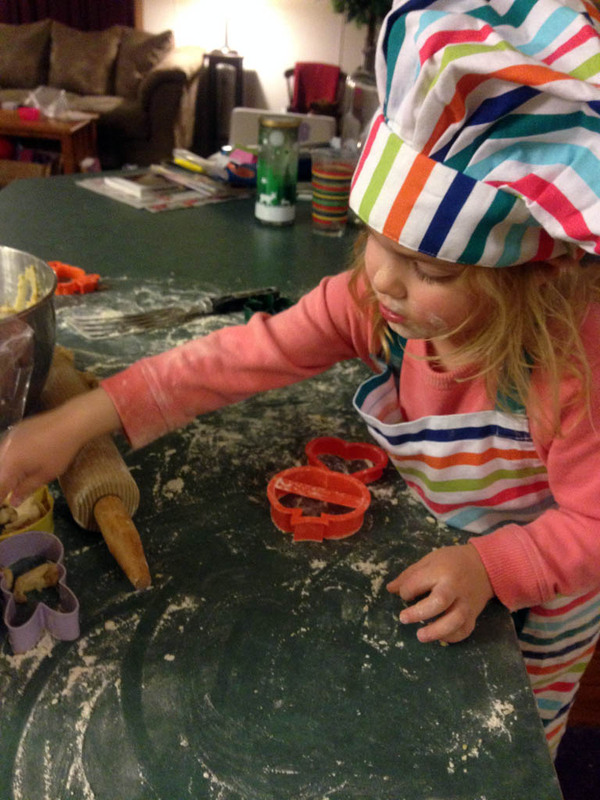 Of course, I’ve got some springtime baking to do, and what better way to start out by letting the tot take over the kitchen a little bit…supervised, obviously! Alex loves Mommy’s cookies, especially the sour cream cookies, so now that she’s 3 it’s time to introduce her to the place where we prepare food and desserts. When it comes to learning new things, she’s an observer, like her mommy, but when it was time to measure the flour she dove right in. 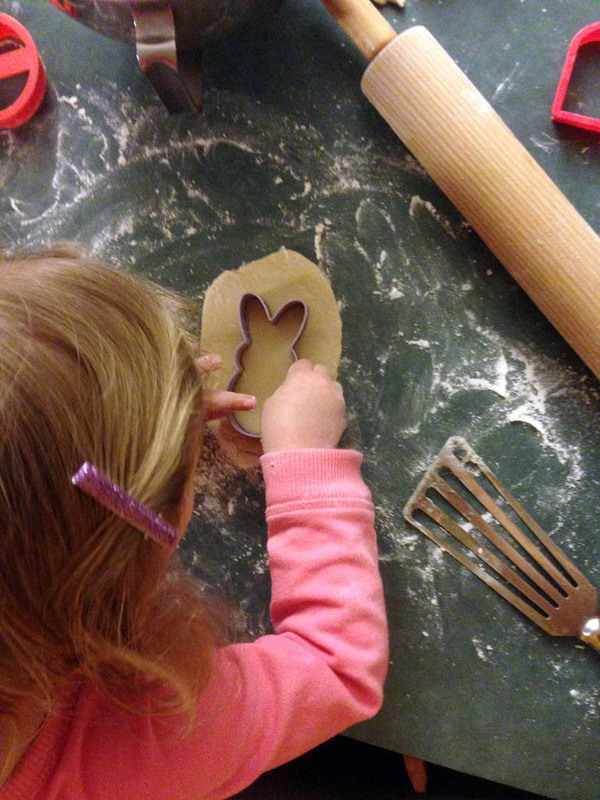 She placed those little fingers into the flour container and spread that stuff all over the countertop! She helped stir the dry ingredients around a little, but she was having too much fun making a mess. Alex is intrigued by the stand mixer. She watched with wide eyes as I alternately mixed the flour and sour cream into the bowl with the wet ingredients*. She wanted to eat that dough and not save any, but she ran off to watch Thomas instead. Alex wanted to celebrate most of the major holidays. We made hearts, bunnies, peeps, pumpkins, turkeys, and shamrocks. She was so fascinated by how the dough felt and yes, tasted when it got on her fingers, and I probably washed her hands about 354 times. 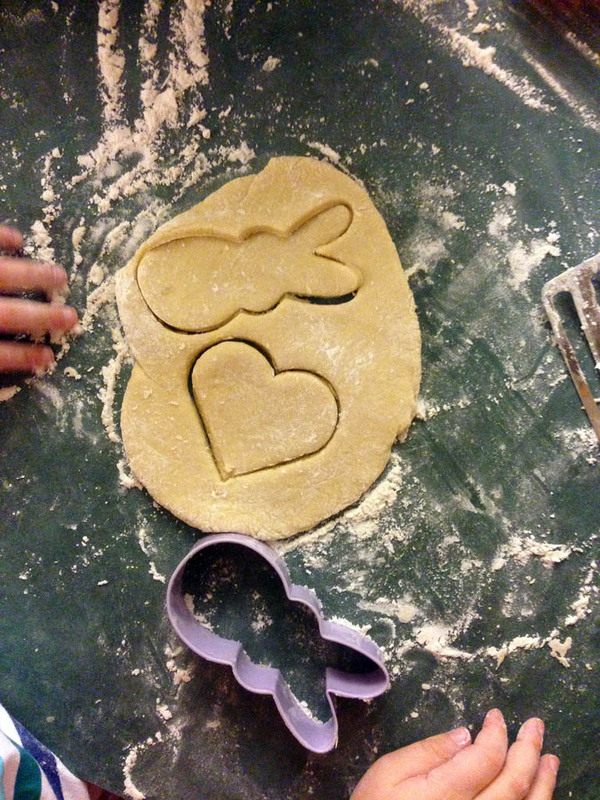 With guidance, she rolled out the dough and pushed the cookie cutters down into it. So much fun was had by all, and there was enough flour on the floor to create an ice rink! Icing is always the fun part! We used the leftover conversation hearts from Valentine’s Day and some Easter sprinkles as the finishing touches for Alex’s creations. 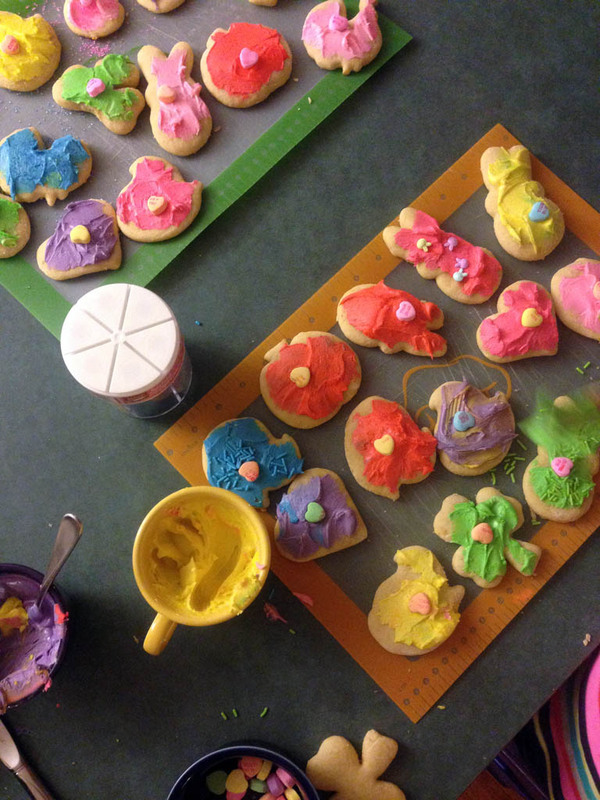 With a tot, you can’t get too technical with decorating, like I usually do, but she enjoyed spreading a little bit of icing on the cookies and topping them with the hearts. 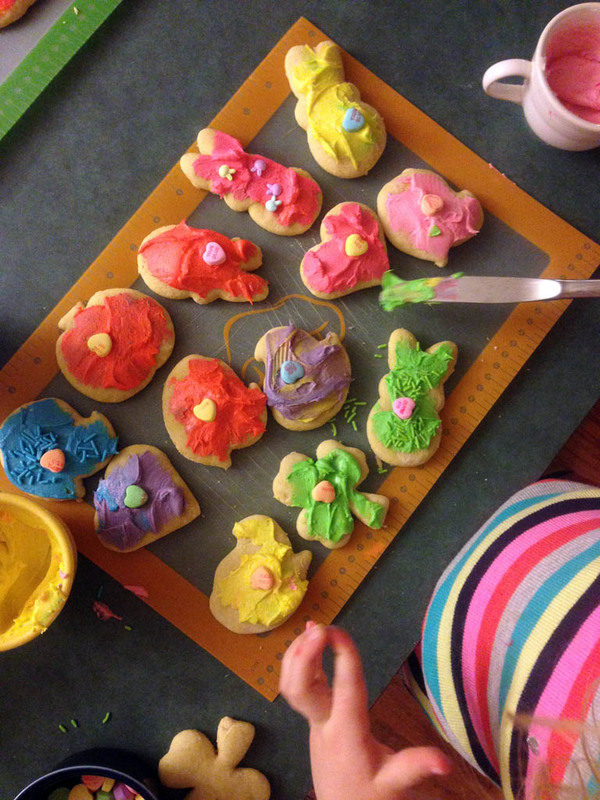 We had a springtime palette of icing, and we made the turkeys purple and the pumpkins green. We made enough cookies to share with friends and family, so we put them in gift bags and tied them up with ribbon. Simply adorable! Cookies made by the tot (with help from Mommy!) 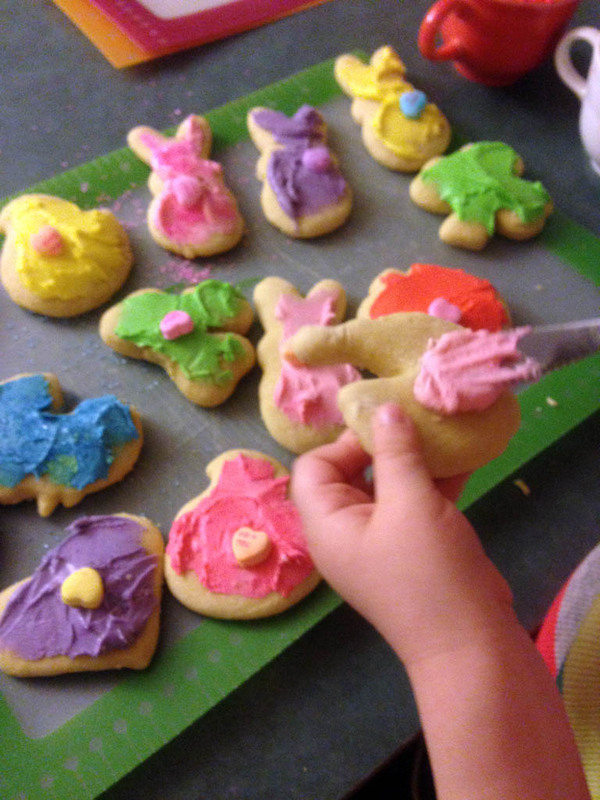 make it extra special for the much-anticipated springtime season, and best of all, baking up a storm with your little one is the best bonding experience ever! *About that sour cream cookies recipe: I began reducing the amount of sour cream that’s being mixed with the dry ingredients!! Instead of 8 ounces, go for 4 ounces! You will not believe the difference!! The cookies keep their shape much better during the cookie cutting process, there’s less flour being used to roll out the dough, and the dough is at a much-desired firmness when you remove it from the fridge!! No more kinda-firm-but-sticky dough! If you haven’t yet, give it a try!! Go here for the updated recipe!